Long-time student and layabout Fumiya (Joe Odagiri) owes ¥800,000 to loan sharks. When a middle-aged thug named Fukuhara (Tomokazu Miura) comes to collect, he offers Fumiya a choice: either come up with the money in the next few days, or join Fukuhara on a leisurely walk through Tokyo and Fukuhara will give him ¥1,000,000 in cash. 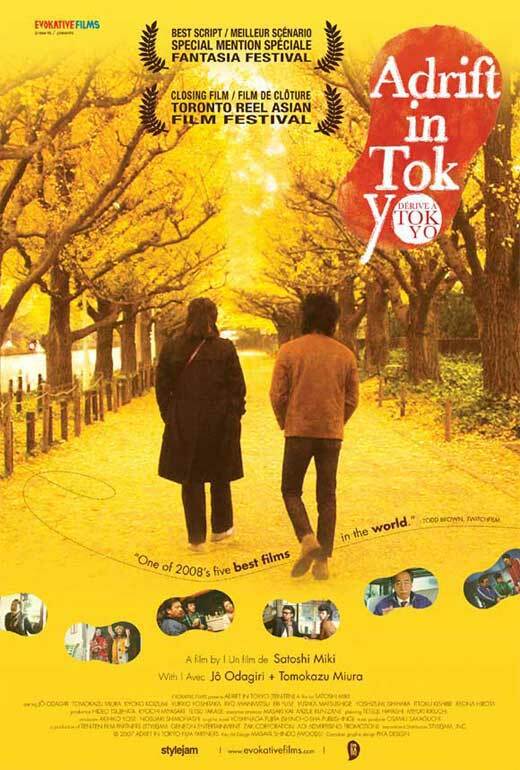 Adrift in Tokyo, a 2007 adaptation of Yoshinaga Fujita’s novel, is a wonderfully charming blend of comedy and drama. It begins as what seems a predictable fashion: an episodic series of comic encounters, following Fumiya and Fukuhara from one famous Tokyo locale to another. It initially feels like it is half-sketch comedy, half-travelogue. It slowly transforms, however, into something more fascinating and complex. It begins to resonate on an emotional level, and spark off story developments from the protagonists’ lives – particularly their regrets. The mystery of why Fukuhara is going on his walk is actually solved relatively early; the main story that dominates the second half comes into play later than you would expect. Director Satoshi Miki keeps events rolling along at a pleasant pace, finding numerous situations to keep the story interesting and the humour running. One sequence sees Fumiya following a roving busker with an electric guitar. Another has the two men looking for a woman at a cosplay festival. A particularly odd subplot sees Fumiya claim that seeing actor Ittoku Kishibe (Zatoichi, 13 Assassins) in person grants one good luck, only for the actual Ittoku to start appearing in the film. It is beautifully underplayed, and just wonderfully absurd. Categorising the film is essentially a pointless task. If forced to pigeonhole its genre it is most obviously a comedy, but the drama works so well. Its complexity is buried delicately underneath the jokes, and the film is a far more laudable and intricate work than at first it might appear. Joe Odagiri is in fine form – he is one of Japan’s most reliably good actors – but it is Tomokazu Miura who makes the strongest impression as Fukuhara. Weary, eccentric, and varying between being sentimental and bad-tempered, his character and back story unfold gradually as the film develops. From scene to scene he simply keeps growing more complex and intriguing. Kyoko Koizumi arrives midway through the film as Makiko, a woman who sometimes masquerades with Fukuhara as husband-and-wife during weddings and funerals. She gives a far more naturalistic take than her co-stars, but it is a take that works. Makiko is a readily familiar character that most viewers will recognise immediately, and adds a great deal of warmth to the film. Technically the film is relatively straight-forward – almost banal – with a matter-of-fact sense of photography and a limited musical score. Fans of Tokyo the city will enjoy seeing a street-level view of its various precincts. While generally avoiding tourist sites, it is all immediately familiar to anybody who has ever travelled there. That easy sense of comfort dominates Adrift in Tokyo. This feels like a wonderful warm blanket.